Banff is about 130 km west of Calgary; bus and limo services are available, including regular service from the Calgary airport. There is a regional bus service both within and between the towns. Visit Roam Transit for routes and schedules. There are many taxi companies in the towns and can also transport you between the towns. You must call for a pick-up (flagging down a taxi is not recommended). In the event some hikers are unable to find a parking spot, we will again try to arrange for parking at the Jay Street lot (owned by Town of Banff). If we are able to secure these spots, they will be available on a first come – first serve basis. Please don’t expect to arrive later in the Sunday registration & find parking spots to be available. And again, parking at both these spots is at the hikers own risk and responsibility. You will need accommodation and meals for the night before the hike (including breakfast on the morning of departure). Reservations in Banff or Canmore, for Sunday night, need to be made well in advance. Hikers return to Banff or Canmore on Saturday afternoon and, depending on personal travel arrangements, may also need a hotel room for this night. These costs are not included in the hike fees. Campgrounds are available in the Banff area. Contact Travel Alberta for more information on where to stay. Check-in is from 2:00 to 3:30 pm at YWCA Banff Hotel (see photo), 102 Spray Avenue, in the "Great Room". Bring your duffel to the check-in as it will be taken away by the outfitter after 3:30 pm and you will not have access to your duffel until you hike into camp. Orientation is from 4:30 to 6:30 pm (at the same location as the check-in) for a presentation by the Hosts, Chief Leader and Medics. The pick-up times will be provided at the Sunday evening orientation. The drop-off point is the trailhead. The pick-up point is the trailhead at approximately 3:00 pm. 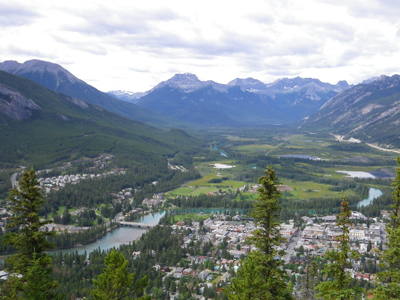 We hope to have hikers back in Banff and Canmore by 5:30 pm on Saturdays but no there are guarantees. Hikers should avoid tight travel arrangements for their continued trip home on Saturday.